Some days you just want to be extra girly and delicate, you know what I mean? And I'm always amazed at how simple it is to do delicate and detailed designs with stamping. Can you imagine if you freehanded something like this? I don't even want to think about it, haha. But the wonderful world of stamping opens all possibilities and makes even the most detailed look super simple to achieve. I feel like I'm doing an infomercial for stamping right now... Basically if you read this blog and haven't tried stamping yourself yet, GET ON IT! Haha. Let's get into the look! 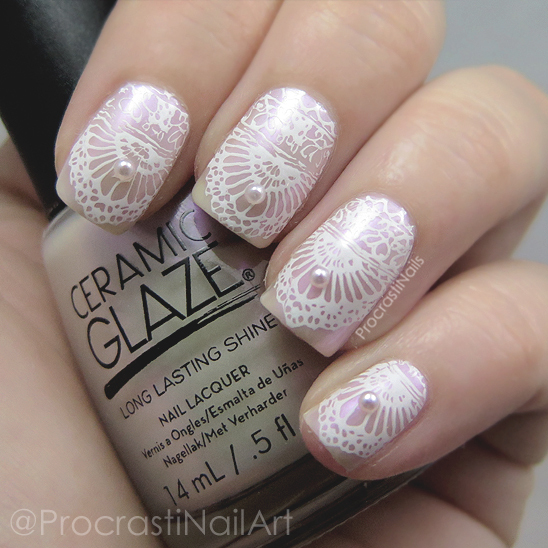 I started out with three coats of Ceramic Glaze Heavenly (swatches here) and then carefully stamped my lace on with Mundo de Unas White and MoYou London Bridal 07 Plate. When that was dry I decided to add some pearls for a little bit more romantic of a look. I think this is the first true bridal look I have done with this plate! I'm in love with how soft and delicate and detailed this look is. And like I was gushing about at the beginning of the post - so simple! What do you think, is this a look you could see on a bride? Or do you like a more non-traditional look? Very pretty lacey design that you stamped on. Stunning look! 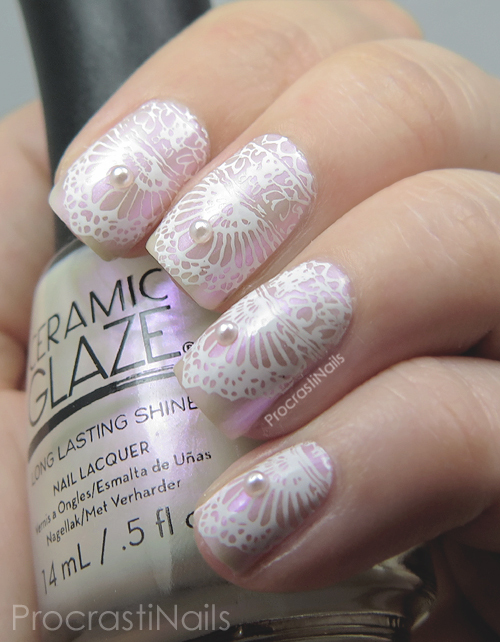 I love the delicate & lovely stamping image over the pearly opal color. Very pretty! I love how the pink shimmer shines under the design, which is so delicate! Very lovely and elegant! I love how delicate this looks! I love this! It is really feminine and sweet. I can totally see this at a wedding! Oh wow. That base color is glowing! I love this! It's so dainty!